The Shoe Lab Inc. will be collecting your gently worn footwear and/or monetary donations to ship the shoes to a person in need, whether they are victims of a natural disaster or subject to living in extreme poverty. It is estimated that Americans have 1.5 billion pairs of unused shoes lying in their closets. The charity can use each and every one of these pairs to make a tangible difference in someone's life. The Shoe Lab, Inc. cares about helping others and the environment this is why The Shoe Lab, Inc. decided to partner with Sole4Souls who we believe is doing an admirable job helping not just people around the world, but also the environment by recycling shoes. We invite you to bring us “any” shoe that you don’t want including the shoes that need minor repairs. If you have a shoe that needs some minor repairs such as new tips, heels, fixed strap, fixed elastic, cleaning or replacing of a sole, do not discard that shoe you can still donate it. The Shoe Lab, Inc. wants to make sure that it is helping the environment and the needy at “best.” A little tender repair will bring those shoes back to life and will help someone in need while helping the environment. If you bring to The Shoe Lab, Inc. your shoes for donation that need minor repairs, we will repair them at no cost to you. After the repair, we will make sure that Sole4Souls receives your donated shoes to share with someone in need. Someone out there in the world may desperately need those shoes, join us to make a difference. Soles4Souls is a Nashville-based charity that collects, recycles and reuses shoes from warehouses of footwear companies and the closets of people like you. We distribute usable shoes to people in need around the world (we recycle less than 2% of donated footwear). Since 2005, Soles4Souls has given away nearly 12 million pairs of new and gently worn shoes (currently distributing one pair every 7 seconds). The shoes have been distributed in 125 countries, including Haiti, Kenya, Nepal and the United States. 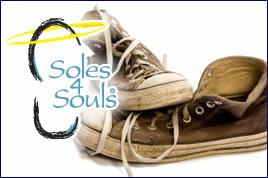 Soles4Souls is a 501(c)(3) recognized by the IRS and donating parties are eligible for tax advantages. Visit www.giveshoes.org for more information.